In the 2011 seminar we derived from Deleuze and Guattari's What is Philosophy? the obscenario, a mode of conceptual thinking adapted for doing theory in electracy (philosophy as media practice). The obscenario is transitional alternative to the scenarios of conventional consulting, as a means to imagine the future in order to decide NOW what policy decisions to make. Concepts are literate, and the purpose of Philosophy, D&G state, is to create concepts. The first challenge for us is to learn how to include conceptual thinking within electrate media, in order to think our way into the new apparatus. D&G analysed "concept" into three components: an idea (term), a problem field addressed by the idea, and a conceptual persona who dramatizes the import of the idea in a situation. Obscenario shifts the emphasis from literate concepts foregrounding of the eidos (abstract configuration of properties) to persona in a situation, which lends itself to imaging. The prototype of a conceptual persona is Socrates, dramatizing "dialectic" as idea in the dialogues of Plato. Avatar Emergency (AE) does not begin immediately with the phenomenon of "avatar," but approaches it through the formation of an obscenario, that is, through "concept avatar." We must rely on this mode to carry us some way into the invention of a post-literate practice. The phrase is ambiguous: the concept of "avatar," and an avatar of "concept" (which itself may not appear). The first step, in other words, is to develop within our literate skills a concept adequate to the experiment we propose: a practice that does for electracy what the dialogue did for literacy. The relay from Socrates is useful to identify the features of obscenario, which we should inventory in order to utilize them in our own variations. There are several levels for emulation: 1) Plato creates the dialogue as a "tale" for his CATTt, to communicate in writing the new logic of dialectic. 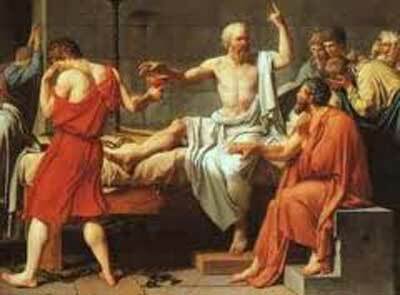 Students are introduced to dialectic (analysis and synthesis) through an interface metaphor, the behavior of the gadfly Socrates. Dialogue as pedagogy requires a certain attitude: a commitment among friends to suspend competition in order to discover what is objectively (logically) true; 2) the scenario proper is Socrates encountering an interlocutor on the streets of Athens, in everyday life, as in Euthyphro, for example. Euthyphro is in a situation: he has decided to prosecute his father for impiety. Socrates asks Euthyphro to define his terms: what does he mean by "impiety." Of course the definition of "impiety" makes it into a concept -- a literate skill, but Euthyphro is not literate. 3) The context for the apparatus is the invention of practices of logic to augment pure reason, as a capacity of selfhood (individual identity) in a democratic state (collective identity). AE introduces concept avatar as obscenario, a vehicle for thinking a new identity formation, via ideas evoked in a problem situation, dramatized by a persona (it is not concept proper, but an allegory of an idea). The instruction is to extrapolate to our own case.